Saint Monica (331?-387) was the mother of Saint Augustine. Born in Tagaste (now known as Souk Ahras in Algeria) in either 331 or 332, Monica was raised in a Christian family. She married Patricius, a pagan who served on the City Council of Tagaste. Augustine was the couple's eldest son. In the Confessions, Augustine says that she married young, and was a good and patient wife who was generous to her husband. He further notes that Monica had a cordial relationship with her mother-in-law, and was a peacemaker. Monica was a good mother, but Augustine, as a young man, did not follow her example of Christian faith. Monica prayed continually for her son, as well as for her husband. Both Patricius and Augustine did eventually become followers of Christ. Augustine credited Monica with planting the seeds of faith in his heart. He called his conversion a return to the faith which had been instilled in him as a child. When Augustine and his friends would get together for philosophical discussions, Augustine would invite his mother to join them. Her wise comments helped nurture the faith that had begun to grow in Augustine's heart. 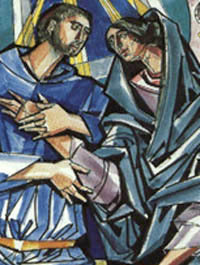 The conversion of Augustine, whose earlier ways had caused many tears, brought particular joy to Monica. She was present at his baptism. On her way back to Africa with Augustine, she died at Ostia, near Rome, probably some time in October, 387. Her remains are at the Church of Saint Augustine, Rome.